By now that might not be a surprise to you, as I share my distaste for this disgusting vegetable frequently. What you may not know is that I wasn’t always this vocal about my longstanding “cauliphobia.” It was always something people eventually learned about me. Our dislikes, particularly when it comes to food, are the sort of thing that only our closest family and friends typically know. Yet for me, sharing this quirky fact became something interestingly personal. 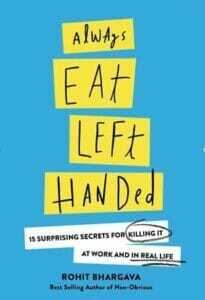 Realizing this was such a powerful personal lesson that I wrote an entire chapter about it in my career advice book “Always Eat Left Handed.” Here’s an excerpt of that chapter – to explain a bit more about why I have become such a public enemy of cauliflower everywhere … and why you might benefit from making a similarly random declaration of your own. It is and has always been my least favorite “food.” I hate the smell, the look, and the texture of it. I think it barely deserves to be called food. There was a time when I used to keep my disdain for cauliflower to myself. I’d smile politely and quietly avoid it. I might have even taken some on my plate to please a particularly overbearing host . . . especially since cauliflower is a very common ingredient in a lot of Indian dishes (and it is almost impossible to refuse food from an Indian host!). Then one day I decided I would stop pretending. From that day onward, if I was invited to dinner and someone asked if there was anything I didn’t eat, I had my answer ready. I would single out cauliflower. Some people would smile. Some would ask if I was allergic (I’m not). The most ambitious would try to convince me that I would almost certainly love it if I could just try that one magical recipe which only they know about. I always refuse with a smile. There is nothing anyone can do to cauliflower to make it something humans should eat. Now before you dismiss me as a picky eater, I should tell you that I am quite the opposite. I’ve tried deep-fried crickets on the streets of Hong Kong. I had whale tartare in Norway. On a recent trip to China, I was the only one in our group (Chinese included) who was excited to order and taste sautéed pig’s kidneys. If you told me something was a delicacy in a strange land, I would probably take a bite just to know what it tastes like. I am the sort of traveler who always tries everything. Over time, though, something interesting started to happen when it came to my dislike of cauliflower. My unapologetic public disdain for it became a way for people to get to know something unexpectedly personal about me. Just as newly dating couples eventually figure out how their partner likes their coffee, my “cauliphobia” as I sometimes jokingly called it, was a small quirky fact about me that people remembered. Yes, it sounds strange. But I started bonding with people over my intense dislike of a vegetable—and my willingness to share it. One of the most basic skills that many lawyers learn early in their law school training is how to make a qualified statement without revealing a personal bias. In order to project what is often called “confident uncertainty,” they will use words like appears, seems, suggests, or indicates. They will start sentences with “some people believe . . .” or similar lead-ins. It works in the legal environment, where opinions can and may be held against you in a court of law. In the business world and real life, though, having opinions is highly desirable. In fact, having an opinion usually makes the difference between whether you are adding value to a situation or just mindlessly following orders. We seek out people who have a point of view. We listen to advice from them. We look for them to lead us. Yet this is not an open invitation to be closed minded either. You don’t have to say something that everyone around you agrees with. You do, however, have to be able to argue for what you believe – even if it happens to be as silly as hating cauliflower. People with a point of view aren’t pushovers. They earn respect because of the strength of their own convictions. Yet that doesn’t mean you should never change your mind or evolve the way you think. Having a point of view is great – but not when it is based on ignorance. My hatred of cauliflower may be illogical, but it is not uninformed. I am tragically well informed about the disgusting flavor of that vegetable and even used to eat it as a child. In matters of taste, you can always have your opinion. When it comes to bigger more important things, it important to learn how to be what author Al Pittampali calls “persuadable” in his book of the same title. Being persuadable means being willing to update your beliefs when confronted with evidence that they may be wrong. Or taking the perspective of others. This is the balance that is hard but necessary to strike – between having enough strength to build your own point of view and defend it, while also remaining open minded enough to evolve your beliefs when confronted with new information or facts. It has always been difficult for any one of us to separate the things that we believe from the things that could objectively be proven as facts. The media we consume can be biased in either direction, and it can lead to mistaken assumptions and the ability for anyone to prove any point simply by twisting “facts” into one direction or another. When you add this to the epidemic of fake news online, it is a perfect storm for masking the truth. Yet the upside of this 24/7 media environment is that you always have the means to access verifiable facts if you are deliberate about crafting a point of view from a variety of sources. In fact, this skill of navigating media bias is so important that a host of high schools and universities across the world are now teaching “news literacy” as a basic skill each of us will need in order to succeed in the world. One of the hallmarks of a “yes-man” or “yes-woman” is agreeing with everything the boss says blindly. Yet psychologists who study human behavior know that agreeing with others in a large group is a natural thing to do. Psychologists call this the “spiral of silence,” where members of a group become fearful of isolation and gravitate to share the opinion of the vocal majority. The best way to combat this effect is a technique often used in debate classes … occasionally take an unpopular position deliberately so you can challenge yourself to argue for it. This little action, though sometimes infuriating to the people around you, can do wonders for your ability to craft your own more powerful point of view because you have been forced to consider an opposing point of view and see the world through the eyes of someone who believes something different than you. *Final Note:I thought it would be nice to include a photo at the top of this page along with the introduction – and I usually do. Unfortunately, the most logical image there would have been a picture of cauliflower … and I just didn’t feel right forcing that upon either one of us. Trust me, it’s better this way.